Follow PINK TANK SCUBA on Facebook! 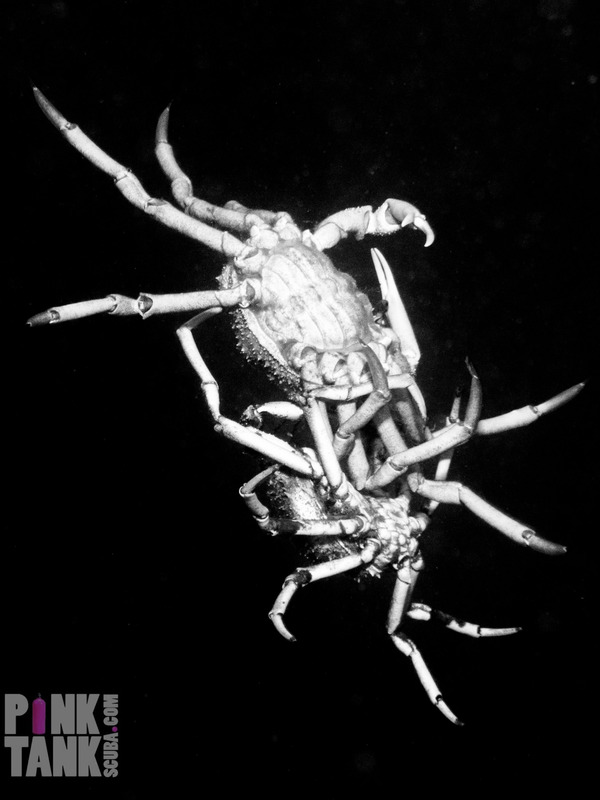 I have been diving with spider crabs during their annual aggregations in Victoria, Australia for the past five years, and this season I have been filming and photographing them underwater most days for the past few weeks (my oncology team tell me to do ‘whatever makes me feel alive’, and this is definitely what does it for me 😀 ). You can find plenty of other posts on my blog featuring images and videos of my previous adventures with these amazing creatures. 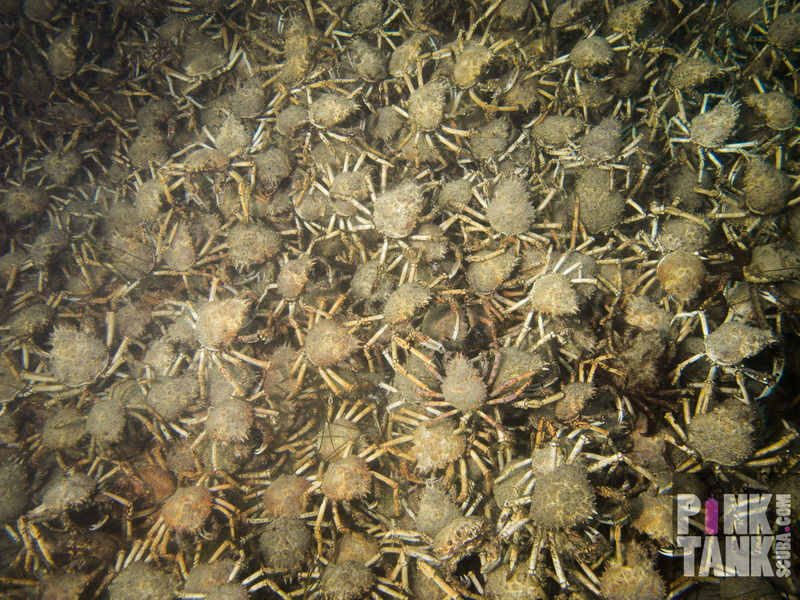 You may remember this video I filmed recently of an enormous spider crab pyramid at the same location? But in all those years of spidey diving, this was the first time I had finally spotted one in the process of moulting its old shell. There is nothing more fascinating than seeing this natural phenomenon occur. From a filming perspective, it wasn’t easy to remain motionless on the cold, sandy bottom for so long during the moulting process (which can take up to 20 mins). I tried to remain calm despite the rising sense of thrill and awe at FINALLY witnessing this miraculous event with my own eyes. And just as I thought I would truly see the crab emerge entirely from its old shell like a butterfly emerging from a chrysalis, I felt something large nudge against my right arm with a determined sort of insistence. Right from the start, three huge smooth rays had circled the ocean floor beneath the pier, waiting for the large orange soft-shelled crabs to emerge from the old, hard shells they had outgrown. Now, towards the end of the crab’s painfully slow moult into its new life, here was the largest predator of them all, pushing its nose against my arm to instruct me to get out of its way – how dare I position myself between a 2.5 mtr wide stingray and its next scrumptious snack? Horrified for the crab (and mortified by the prospect that I may not get to finish filming the moulting process), I pushed the stingray gently back with my hand. Again it pressed its nose insistently against my arm and I was not foolish enough to argue further. I quickly but reluctantly repositioned myself on the other side of the pylon to record the ravenous ray slurping up the newly soft-shelled crab like spaghetti marinara. 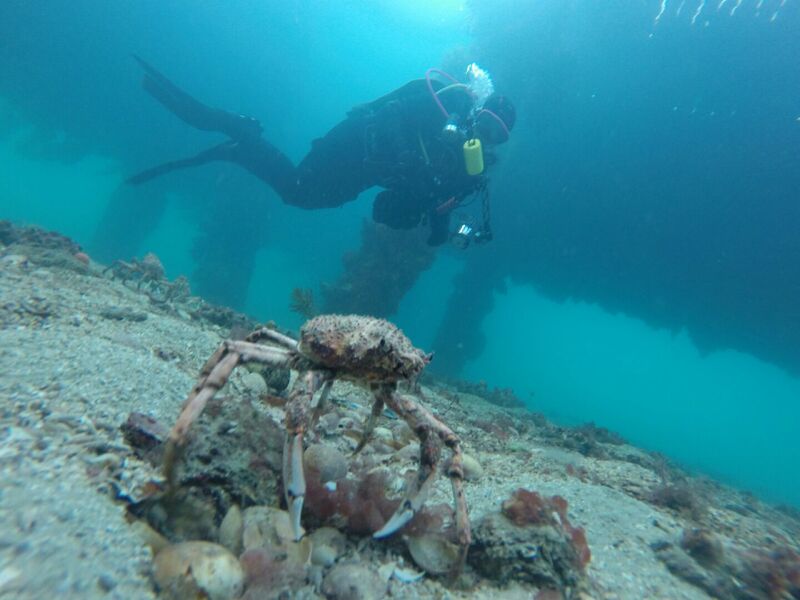 This entry was posted in Videos and tagged Australia, cancer, health, marine, Melbourne, mortality, moult, nature, ocean, photography, pink tank, Port Phillip Bay, pt hirschfield, scuba, spider crab, underwater. Bookmark the permalink. Beautiful video and interesting event to watch. You observed the cycle of life in a more abrupt form. Best wishes and keep posting! Pingback: Stingray eats moulting Australian giant spider crab ‘like spaghetti marinara’ | moomblr! Pingback: Stingray eats moulting Australian giant spider crab 'like spaghetti marinara' | The Management Authority Inc.
Amazing work. What did you film/photo with? I’ve dived the migration a couple of years ago. 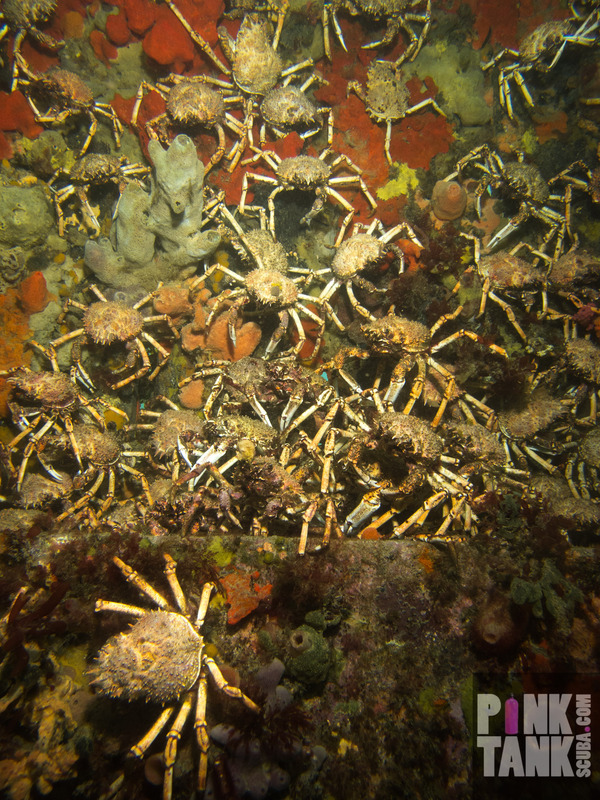 Quite eerie to see a bunch of spider crabs like that. I’m studying the smooth rays (Or short tail stingrays as we call them here in NZ) for my PhD and your videos are wonderful! Would you mind me showing people a short clip of the ray eating the crab in presentations? Crediting you of course! It’s a fantastic representation of habituation to a food and the intelligence to wait for the complete moult, and of their feeding mechanism! Loved the video – great videography! And in such cold water! I did feel bad for the poor crab though!! Thanks for sharing!! Guess the pretty ray has to eat too. Granted can’t blame the ray, crab legs are pretty tasty!